This means that dogs experience the world around them very differently to how we humans do. While we rely primarily on visual cues to interpret our surroundings, odours are far more important to dogs. So, it seems fairly clear that dogs can smell fear. But why does this matter? For someone with cynophobia, the idea that, no matter how calmly you behave, a dog can detect your emotions, and will act aggressively towards you if you feel afraid, is a truly terrifying thought. The belief that feeling fear in the presence of a dog potentially puts you in danger of being attacked, can lead to a cycle of rapidly escalating fear - feeling afraid becomes a trigger for more fear, and so on, until you reach a state of complete panic. So, is there any truth to the notion that dogs will be aggressive towards a person who is feeling afraid? If not, what do dogs actually do when they smell fear? What do dogs do when they smell fear? What they discovered is that, rather than being more likely to approach the strangers, the dogs that were exposed to the fear odour were actually less likely to do so, and instead spent more time close to their owners. On the other hand, the dogs that were exposed to the happiness odour were more likely to approach the strangers, and spent less time with their owners. This study clearly demonstrates that when dogs smell fear they will tend to keep their distance from strangers and prefer instead to stay close to a familiar person with whom they feel safe. What should you do if you feel afraid? 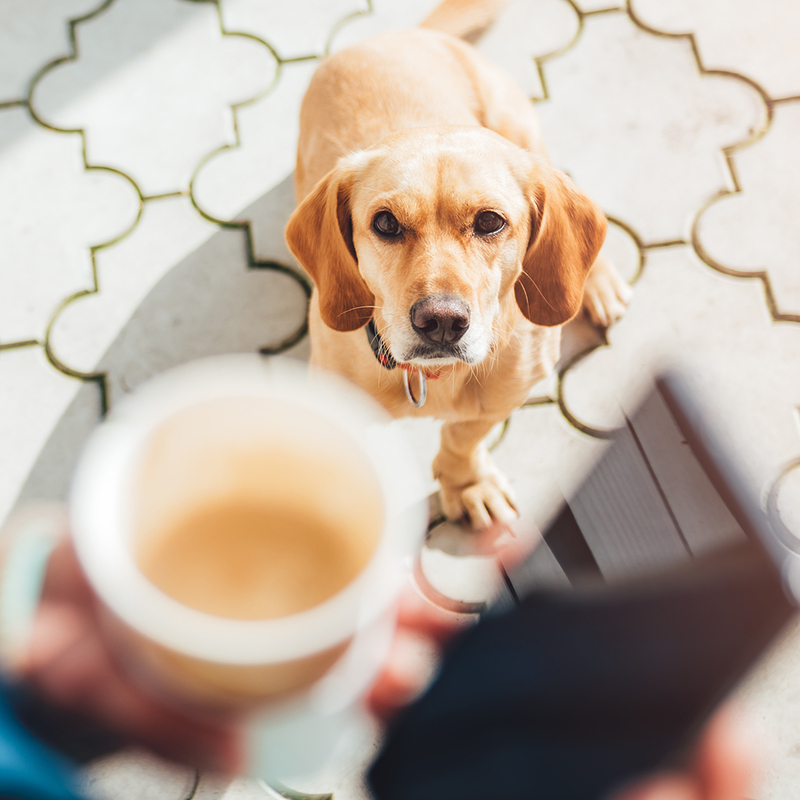 Now that you know you don't need to worry about dogs behaving aggressively towards you simply because of how you feel, you can focus instead on what you do when you're around dogs. The reality is that, unless you're being pursued by a police K9 unit, the vast majority of dogs you will encounter will not attack or chase you, no matter what you do. However, if you are very fearful of dogs, it can be helpful to know how to behave when a dog approaches so that it pays less attention to you. 1. Stand side-on. Don't directly face the dog or turn your back on it. Turn your body sideways if the dog jumps up on you. 2. Stay still. Don't run, back away, wave your arms around, or try to push the dog away, even if it jumps up on you. Fold your arms across your chest. 3. Be silent. Say nothing. Don't yell at the dog or give commands. 4. Look straight ahead. Keep your gaze up. Don't stare directly at the dog. 5. Be patient. Wait for the dog to calm down or give you space, then carry on. In summary, dogs can smell your fear, but if anything this makes them less likely to approach you, not more likely. Therefore, if you're feeling fearful around a dog, you don't need to worry about your emotions triggering a negative reaction in the dog, and can instead focus on behaving calmly so that an approaching dog will pay you less attention. 2. Hamilton, J., Vonk, J. (2015). Do dogs (Canis lupus familiaris) prefer family? Behavioural Processes, 119, 123–134. 3. Schoon, G.A., De Bruin, J.C. (1994). The ability of dogs to recognize and cross-match human odors. Forensic Science International, 69, 111–118. 4. Berns, G. S., Brooks, A. M., Spivak, M. (2015). Scent of the familiar: an fMRI study of canine brain responses to familiar and unfamiliar human and dog odors. Behavioural Processes, 110, 37–46. 5. Siniscalchi, M., d’Ingeo, S., Quaranta, A. (2016). The dog nose “KNOWS” fear: asymmetric nostril use during sniffing at canine and human emotional stimuli. Behavioural Brain Research, 304, 34–41. 6. D’Aniello, B., Semin, G.R., Alterisio, A. et al. (2018). Interspecies transmission of emotional information via chemosignals: from humans to dogs (Canis lupus familiaris). Animal Cognition, 21, 67.